Health or Meditation or Both? With us you can learn to make your body more healthy and vibrant. Or you can learn to become more present, feel what is inside you, and quiet your mind and emotions. Are you more interested in health or in meditation? You can explore either or both through our tai chi, qigong, and bodywork. Qigong masters are legendary in China for living long, vibrant lives, and for being doctors of Chinese medicine who help others do the same. We’ll teach you qigong and tai chi tools for self-help that such masters have refined, practiced, and taught for thousands of years. These tools work differently than exercises that stretch and strengthen your muscles. Our exercises strengthen and balance your chi (qi) or life energy, which in turn tunes every system of your body from your joints, organs, and spine to your nerves, muscles, and immune system. Our founding teachers, Bill and Kathryn, are trained as Chinese medicine bodyworkers and bring this expertise to you in a nurturing classroom environment. In general, the arts of tai chi and qigong were not originally developed in China as forms of moving meditation. A host of different qigong (energy skill) practices have been developed over the last few thousand years in China to enable people to gain more chi (qi) life energy. Tai chi was developed within the last few hundred years as a martial art based on qigong movement principles. There were groups in China, however, who did focus on developing, using, and adapting forms of qigong and tai chi for meditation. Among those groups were people involved in the Water Tradition of Taoism. Taoism is a Chinese philosophical, spiritual, and religious tradition which dates back thousands of years and which has many branches. Water Tradition Taoist practitioners have especially been interested in the spiritual and meditation aspects of Taoism. The moving meditation qigong and tai chi practices we teach come from this tradition. 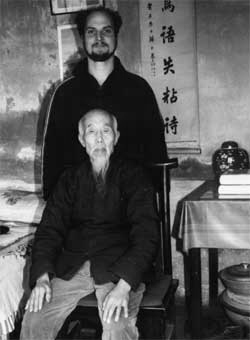 We learned these practices from Taoist Lineage Master Bruce Frantzis, who learned them in China from his teacher, the late Taoist Sage Liu Hung Chieh. If you choose to practice tai chi and qigong as meditation with us, we will teach you three aspects of doing so - mental focus, relaxation, and spiritual exploration. You can choose which of these aspects are most important to you at any time. It is no coincidence that tai chi and qigong have been used for both health and meditative purposes. From the perspective of the Taoists, health practices and meditation practices are two sides of the same coin. Throughout their history, Taoists have been particularly interested in the challenge of how to simultaneously make their bodies healthy and their minds and spirits clear. They have developed rich and sophisticated tools to do so. Among these tools are our Water Tradition foundation practices. They are vessels for thousands of years of accumulated knowledge. A healthy body with freely flowing energy allows one to delve deeper into the practice of meditation. And a calm, focused mind is necessary to access the full healing potential of qigong. With study and regular practice, you can develop a practice in which you simultaneously cultivate the health of your body, relax and focus your mind, and explore the depths of your spirit.